Creative holidays are becoming increasingly popular. And with good reason. There are few things more restful than combining a creative journey with a relaxing break in a beautiful destination. An artistic holiday compels you to consider your surroundings with fresh eyes. It helps you engage with your location, rather than simply pass through. That’s why our painting holidays in Halki are in demand year after year. Held in the first two weeks of May, they offer the opportunity to explore the magical ‘Island of Peace and Friendship’, while learning a new skill or improving your painting technique in the company of a friendly group of people with shared interests and a mutual love of Halki and Greece. Some great news just in! We have started selling our Halki holidays for 2017 and our villas in Halki that are not pre-booked are now free for 2017. Get in touch as soon as possible to secure your favourite villa! How many times have you returned home from another Halki holiday and you wondered, “OK, I’ve bought this Halki pasta, but how does one cook it?”. It would be great to have one of your favourite taverna owners and cooks there to assist, but that’s a little difficult. 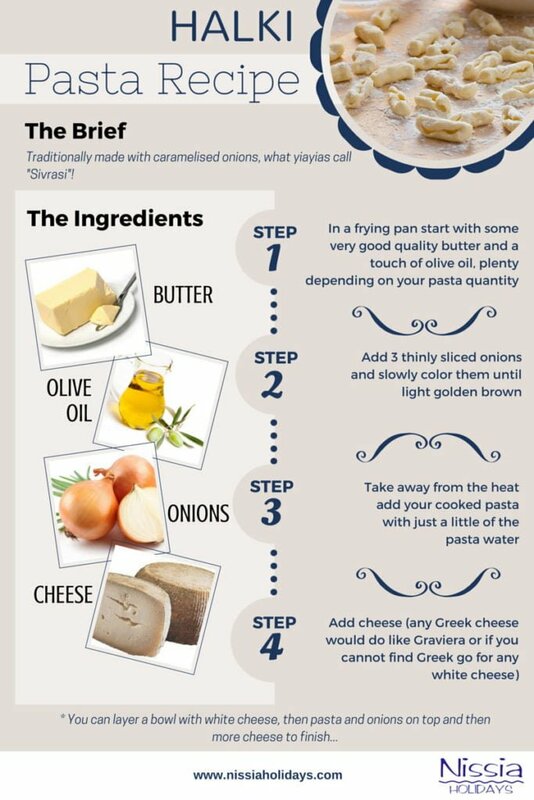 Worry no more, we’ve come up with the traditional Halki pasta recipe so that you can make the lovely onion sauce in order to cook your pasta, in true Halki fashion.